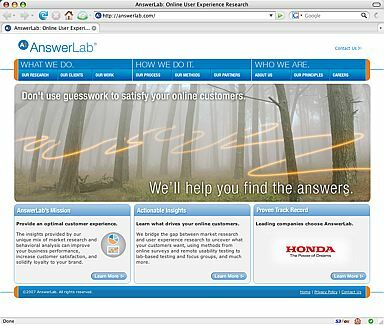 AnswerLab provides top-notch usability studies for today’s websites. Clients use AnswerLab’s detailed usability reports, based on test subject feedback, to make improvements. As experts in their field, the professionals at AnswerLab know the importance of maintaining a robust and effective web presence. Getting Sites Built was hired to upgrade and update AnswerLab’s existing website, so that it better reflected the honed AnswerLab business model. Working with a third-party designer, we re-engineered their outdated site into a web standards-based site. By facilitating a team environment, through open and detailed communication, we developed a clean-coded infrastructure during the same timeframe that the designer worked on his deliverables, the look and feel of revamped content. The specifications called for XHTML and CSS. We used these standards to build a stable site structure, ensuring that the resulting site would validate and be well represented in a wide variety of browsers. We also crafted a site that would be simple to update by using ‘include’ files for repeating items such as the footer and various sidebar areas. Thanks to strong project management, the new and improved website went “live” right on schedule. We were very pleased with the positive feedback we received from AnswerLab and their in-house beta testers. Thanks to the successful project completion, Getting Sites Built was given an additional contract to turn the AnswerLab client list into a dynamic Flash component. The new website boasts featured client logos that subtly cross-fade, selected from AnswerLab’s notable Fortune 100 clientele. Now AnswerLab has a modern website that truly represents their innovative work. We build the website you’ve always wanted.